Since 2002, Customer Paradigm, an award-winning interactive agency located in Boulder, Colorado, has been providing superior SEO and internet marketing services to Denver, Boulder, Colorado Springs, greater Colorado, and companies across the U.S. and Canada. Our goal is to provide the greatest return for each dollar spent on marketing. For more information about search engine marketing with Customer Paradigm, call us at 303-473-4400 or contact us to speak to a real person now. Why choose Customer Paradigm’s SEO services? CPC Campaign Management with NO MARKUP — We bill you only for our time to set up and monitor campaigns, the rest goes straight to your advertising budget. Charging a percentage of ad buys creates an incentive for the marketing agency to make sure you’re spending as much as possible, instead of concentrating on providing maximum value for your spend budget. We ensure your are getting your money’s worth by letting you know exactly how your dollars are spent. Plus our in depth monthly reports give you the qualitative data to make decisions about your advertising spending. 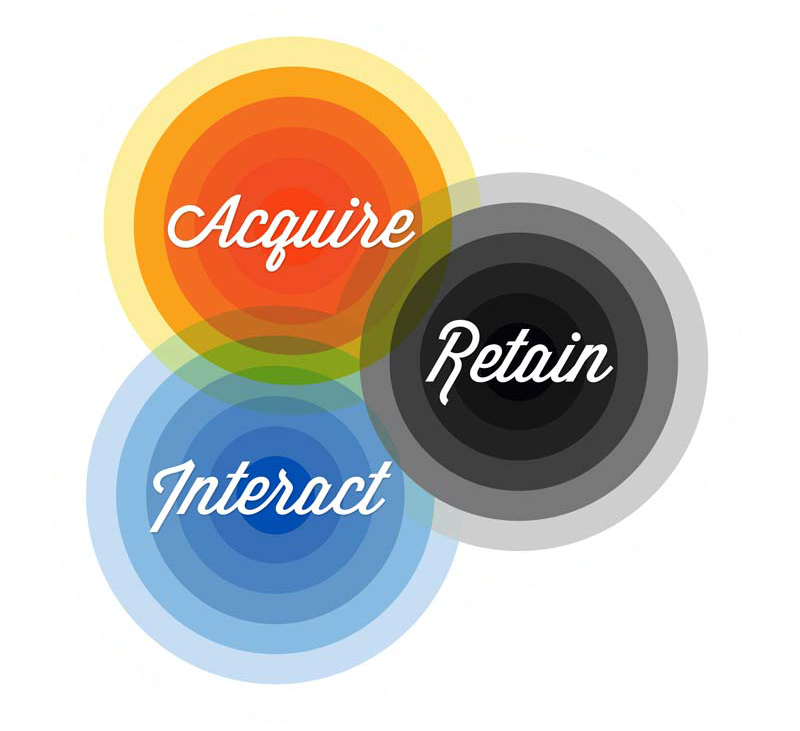 We help focus on what matters to you – acquiring new customers through search engines. No budget is too small or too large. Some clients spend $50 per month, while others spend tens of thousands on search engine marketing campaigns. We offer our clients industry-leading Internet marketing solutions in retail, technology, finance, travel & hospitality, consulting, banking, telecom and health & wellness. Direct Contact with your SEO Project Manager — At Customer Paradigm we boast the ease of being able to pick up the phone and call your SEO project manager. We know that businesses are born through the growth with relationships around us. You won’t be another number in a ticketing system with Customer Paradigm SEO services. Your Conversion Goals are heard. — Not everyone is needing the same results out of their webpage. We understand this, you may need to sell more, you may want more social media followers, or even your webpage to be simply seen to share information. Whatever you goals for your website, we will target. Many SEO firms will put you through the same “SEO process” not considering the end goal for their clients. No Long Term Contracts — We are so confident of our work and SEO services that we never lock you into a long-term contract. It is our goal to provide results for your end goal month after month. Don’t get locked in with an SEO firm that fails to perform for your site, but you are locked in for 6 months while your site could be growing in ranking with Customer Paradigm SEO services. Stop spending your valuable time focusing on PPC campaigns and let our PPC experts setup and manage your advertising today! Pay Per Click management, for all its benefits, can quickly become time consuming and distracting. You have to keep an eye on your return on investment, campaign performance metrics, and the PPC strategies employed by your competitors. It is a diligent process of constantly testing current and new ad copy, creating landing pages, monitoring bids and employ various marketing strategies on a daily or weekly basis to maximize your conversions and sales. Let our years of experience implement a proven method to optimize your campaign for cost, ad quality, and click-through rate. We have a simple philosophy at Customer Paradigm to help every business connect to their clients and help their business grow. 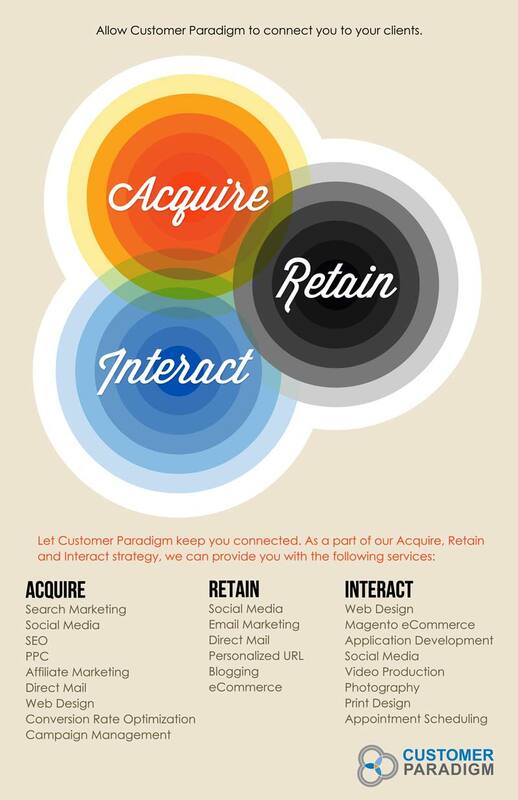 Our philosophy is to help you Acquire new customers, Retain existing customers and then Interact with your customers. 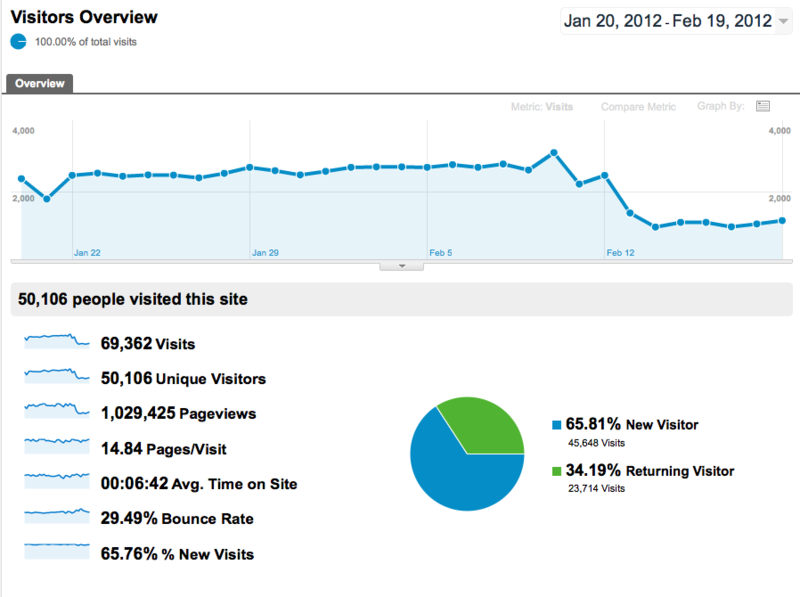 This report is the summary page for the visitor traffic your website is receiving. This page reveals the valuable overall traffic information such as page visits, unique visitors, bounce rates and new visitors. This SEO report is great for monitoring the overall visibility and popularity of your page. Unique visitors are visitors who have never been to your site before, with an increase in these visitors you are able to see that the visibility and ranking for your website is increasing. This is very important for the acquisition of new customers. How are you to acquire new customers if they have to dig through 10 pages of Google results to find your wonderful website? 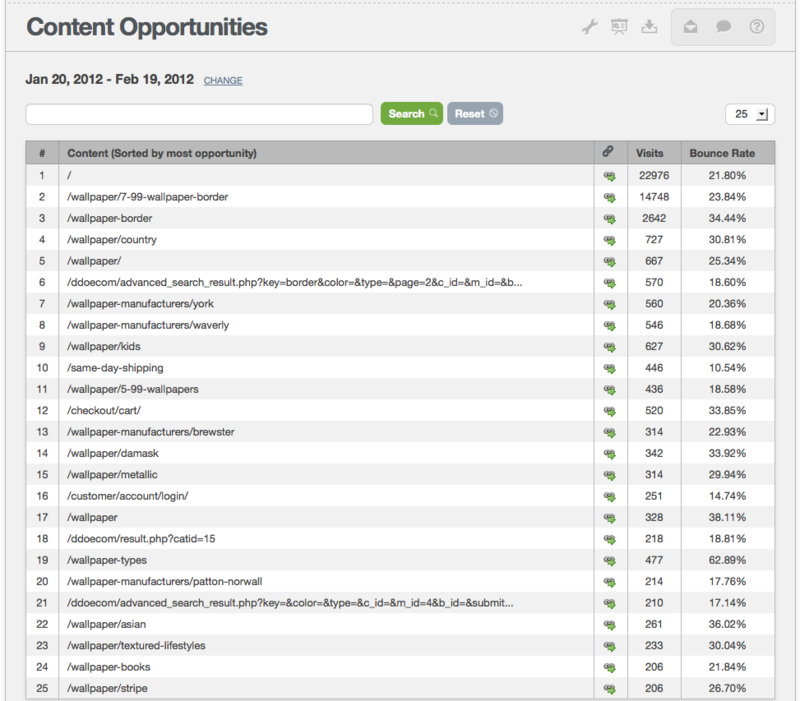 A crawl diagnostic report displays the health of your website. It is like going to get a physical every year, you are able to check on your existing health and predict possible hazards that you can work on fixing now. The errors that the crawl diagnostic report shows are 400 errors such as invalid links, 500 errors which are server errors, duplicate content, page titles, missing page titles and the list goes on of possible errors. It is important to keep up on the health of your website as errors will occur and should be handled properly. If you would like a FREE crawl diagnostic report click here. 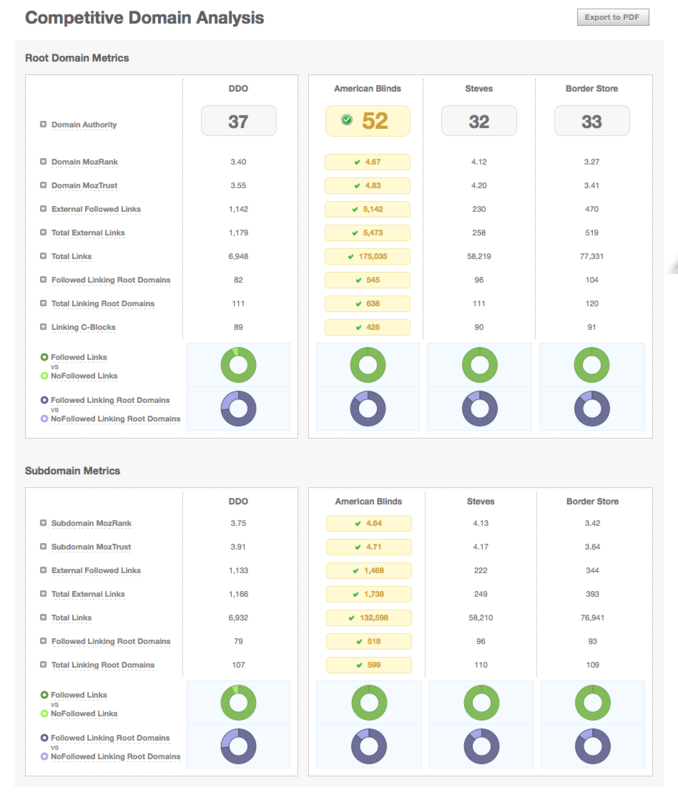 The Competitor SEO Analysis Report compares your website’s metrics to three of your top competitors. This allows us to identify where your website stands in relation to the competitors in your industry. From this we are able to use tailored SEO strategies to increase your website page ranks. 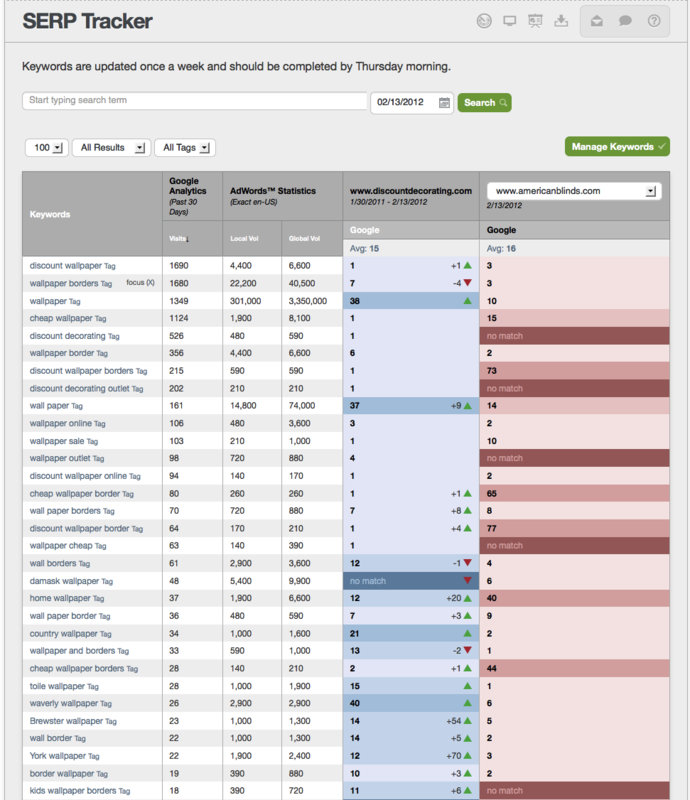 This SEO report shows how your website ranks for the keywords you are monitoring. A keyword is a search query that is typed into a search engine such as Google.com. If you were a flower shop, your search queries [Keywords] would be “Flowers” “flower store” “flower shop in Boulder” etc. Through SEO tactics, the website rankings for the particular keywords will change over time. This is both contingent on your SEO efforts as well as your competitors SEO efforts. You are able to see the Keyword Ranking changes month by month and you are able to view them in comparison to a competitors site. This SEO report allows you to drill into each page on your site to see your top landing pages and their efficiency. This report is extremely useful, because you can directly see how many visits you are getting to that particular landing page. You are also able to see the Bounce Rate for each landing page. The Bounce Rate is a website metric that describes how many people leave your page rather than staying and reading your content. The bounce rate highly reflects the relevance of your site to the search query. With SEO and content development, we can increase the relevance of your pages.